At anchor in a neat little bay on Long Island Sound. 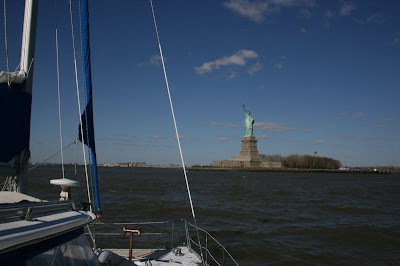 We sailed from Long Island sound past Manhattan through New York Harbor past the Statue of Liberty and then headed south for warmer weather. 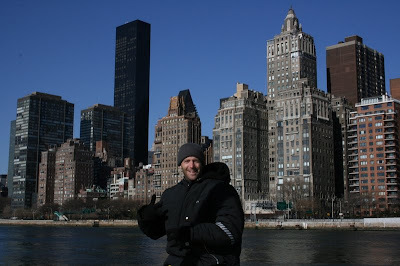 New York and points north will seem much more appealing with warmer weather. Kathy bundled up at the helm as we sail through Hells Gate. Dave in his $4.99 thrift store Michael Jordan jacket and Manhattan. 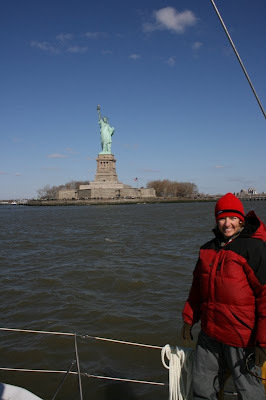 Kathy braves the cold 38 temps with wind chill in the 20's for a picture with miss Liberty. Dave Bundled up and feeling like the marshmellow man with soo many layers. 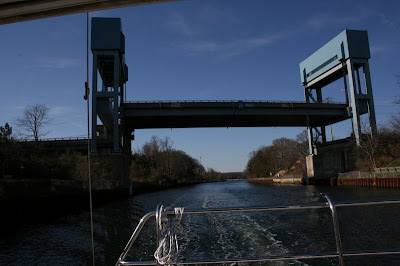 New Jersey Inter-Coastal waterway (NJICW) lift bridge. After a nice offshore sail from New York Harbor we tucked into the NJICW to find a place to anchor for the night we were waiting for our first lift bridge to open, dodged a power boat and accidentally ran aground. Oops! Kathy called the bridge tender and canceled the requested opening The boat was stuck and the tide falling so I though we might have eliminated the need for an anchor for the next twelve hours. Powering ahead or astern yeilded no results. We dropped the dingy in the the water and used it as a tug to push the boat out of the mud. YES! 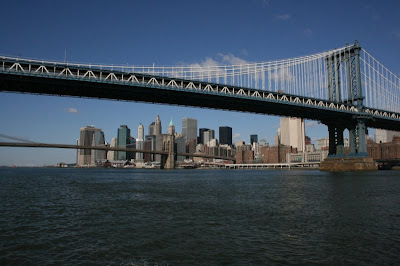 We were free and called the bridge to ask it to open again. The bridge tender gave us kudos for recovering from a embarrassing situation. The NJICW is shallow with the main channel less than five feet in many places. Stray from the channel and you are instantly aground. 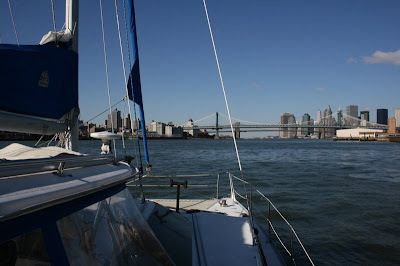 Our biggest observations about our new boat is that it's really easy to sail. It is also very kindly to be aboard as you don't have to hold on or worry about falling over like a mono-hull. Even offshore nothing in the cabin was disturbed during our forty nautical miles offshore. The best part is that we sailed fast without even trying. Boat speeds were seven to eleven knots most of the day as we reached at 120-150 apparent wind (true wind 10-20 knots). After lunch I had a little nap and it was really nice to have the boat be so comfortable, flat and quiet while sailing. We definitely have a few major boat projects to work on like a new head sail, autopilot, sailing instruments, extra depth sounder, more solar panels, batteries and oven for the galley to name a few. So far we replaced a water pump, added a water filter, installed a 50amp battery charger, Xantrex battery monitor, two new VHF radios, a 12000 btu LPG cabin heater, tidied up the electrical system (16+ hours), replaced running rigging, added dinghy davit blocks, purchased a new 25hp outboard for the dinghy, replace fuel filters, tuned up engines, washed all cushion covers, cleaned every nook and cranny, furnished the galley with new everything including a food processor and lots more. Our loose plan is to head south to find warmer weather. Despite the ice on the water this morning the bright sun took the chill off a bit. With lots of little tasks checked off our lists the boat was ready for a sail. 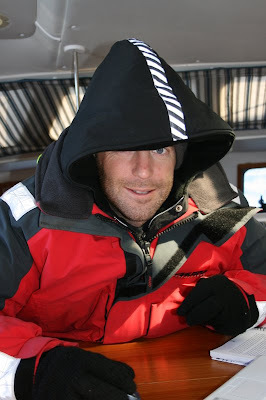 The wind was very light, but I wanted to run the engines a bit so we motored out of the bay and hoisted sail. The wind was reading less than five knots, but we were sailing along at up to four and a half knots... pretty amazing. The boat was perfectly flat and not a single item budged even after sailing across some tug boat wakes. The water temperature is forty two degrees and the air temperature around 35 at noon so not exactly sub zero, but the ice this AM was a shocker. Kathy made a delicious Easter lunch of Grilled tuna, cannelloni bean and fontina cheese sandwiches with fresh spinach and tomato aioli sauce. She is really enjoying here new large and versatile galley and turning out some Very tasty meals. Our new boat will be named "Pacifica"
I say "will" as we must first perform a DE-naming ceremony to avoid offending King Neptune and becoming beleaguered with bad luck. Naming a boat is always tough and we had many criteria and spend countless hours brainstorming and researching. When we came upon Pacifica the search was over. Easily understood on the radio. A name that was unique in the world of boat names. And most of all meaningful. So what does Pacifca mean? In Spanish it is simply the name used for the Pacific Ocean. Pacific Ocean comes from the Latin name Mare Pacificum, "peaceful sea". It is also the Spanish feminine form of the Late Latin name Pacificus meaning, "peacemaker". We like all of these definitions and to us Pacifica, "peaceful home". We'll let you know when it goes online. We awoke this morning hoping to find multi colored easter eggs and an assortment of chocolates, but the easter bunny didn't make it to the boat. Probabbly becuase it's so damn cold today. David "Gosh the water looks a little funny today"
Kathy "Maybe there is another diesel spill like last week". David "Humm sort of looks like ice? "Yes, it is ice!" Kathy "It was only suposed to get to 24F last night. David "WOW, I hope this is a first and a last... let's get some pictures"
Who would have guessed we'd find a boat in New York. It's been lots of work chasing after boats in Florida, St Martin, Dominican Republic, Georgia, Florida, and finally we've struck gold here in New York. The good news is we'll be sailing around the Statue of Liberty very soon. The bad news is it's freezing cold. 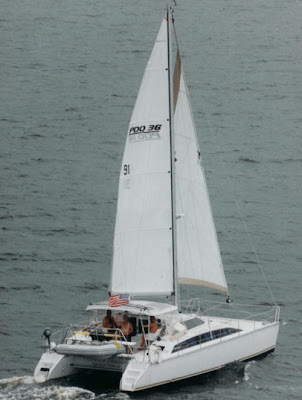 The new boat will be named "Pacifica" and is a PDQ 36. That's 36 feet long by 18 feet wide. 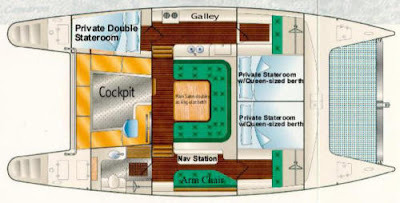 Two legitimate queen beds, one double bed, full galley, navigation station with arm chair, and dinner seating for 6-8 inside, bathroom with separate shower, lots of storage, upright refrigerator, huge freezer and lots of storage. Then we go outside to the roomy cockpit with 10 foot raised bench across the back, two captains on pedestals, hard Bimini enc losable on three side then head forward to lay on the trampolines to soak up some sun (when we find some warm weather). All the while the boat remains nice and flat on it's two hulls, has a stack pack for the main, furling 135% genoa, spinnaker, twin anchors, one power windlass and one manual. A nice set up. 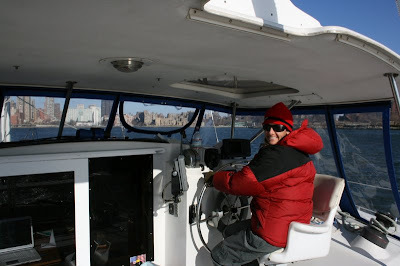 Hoping to get familiar with the boat for a week or so and then head south as soon as possible to find warmer weather. PS New website coming soon.